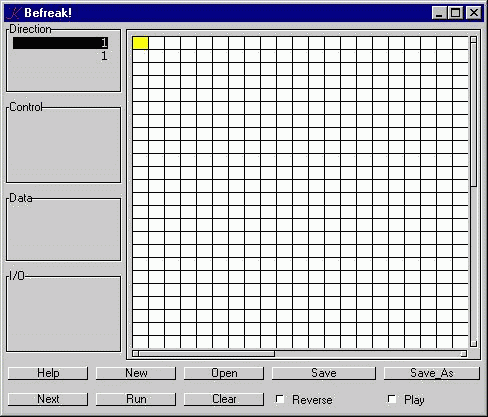 Befreak is a two-dimensional reversible programming language invented by Brent Kerby and Hilton Campbell. Go here for their original documentation and implementation, and here for the K implementation. In the K version, I use 'm' for greater-than. 'l' and 'm' make a nice pair ("less" and "more"), and this choice frees up 'g' for get (to get a token from the current program rectangle) and 'p' for put (to put a token into the current program rectangle). Not yet implemented. Features will be added on an irregular basis. Or maybe not. Assuredly, there are bugs, but "Hello World!" and primes generation work as advertised. B		the numerics buffer, a character vector. C		control stack, an integer vector. D		data stack, an integer vector. E 		input/output stack, an integer vector. I		instruction pointer: P . I is the current instruction. J  		J is 0 (rows) if the direction is north/south, 1 (cols) if west/east. J is 1 (south/east) or -1 (north/west). K 		list of four two-element vectors: (north;south;west;east). P		the current program, a character matrix. R		reverse bit, 0 if normal mode, 1 if reverse mode. S 		string-mode bit, 0 if normal mode, 1 if accumulating the characters of a string. W 		the GUI, a dictionary. X 		matrix of the Befreak instructions. Y		the current file, a character vector. Z		run flag: 0 (not running) or 1 (running). The instruction pointer "wraps" at the edges of the program rectangle. If x is not numeric, we call the numerics buffer-handler. Then we find and apply the instruction for x to x. In most cases, the instruction will ignore the argument-value, but in the case of a numeric constant, e.g. "7", the instruction will push "7" onto the numerics buffer. The Befreak instructions are contained in the matrix X. X[;0] is a two column matrix of instruction characters. E.g. "%*" is one such. If reverse mode is 0, then we execute the function corresponding to X[;0;0]?t, else we execute the function corresponding to X[;0;1]?t, where t is the current instruction token.